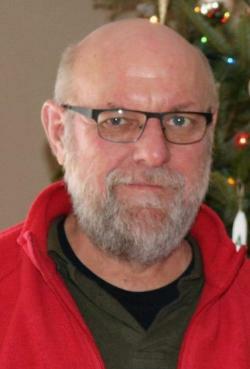 HARTLEY, Rand Edward - It is with great sorrow that the family of Rand Edward Hartley announces his passing on Friday, April 12, 2019, at the age of 58 after a courageous battle with cancer. Rand was born July 19, 1960 in Antigonish and was the youngest child of the late Florence (Rand) and Donald Hartley, Hazel Hill. Rand was a wonderful kind, gentle, carrying man. A Red Seal Millwright by trade. At the time of his death Rand was employed as Faculty, Marine Engineering, NSCC Nautical Institute, where he loved to pass on his mechanical skills to his students. Rand & Emily moved to Mulgrave after they married and they always had a project to work on together in their home. Rand loved to curl, never missing the Hartley Bonspiel in Hazel Hill every March. He loved his fishing trips every year with his brothers, nephews and friends, as well as camping and watching NASCAR. He enjoyed an occasional "Palm Breeze". Rand was a member of the Royal Canadian Legion Branch 37 Mulgrave and a member of St. Lawrence Church Parish Council. Visitation will be Tuesday, April 16 from 2-4pm and 6-9pm in Mulgrave and Area Resting Place, Funeral mass will take place at 11am Wednesday, April 17 from St. Lawrence Catholic Church, Mulgrave, with Rev. Allan MacPhie officiating. The family would like to thank the doctors and nurses of St. Martha’s Hospital, especially the Palliative Care Unit, for their kindness. Donations in memory of Rand can be made to St. Martha’s Palliative Care Unit, Mulgrave and Area Resting Place, St. Lawrence Parish or a charity of your choice. Family flowers only. Burial in the parish cemetery.